Hello! My name is Brett and I am a special education from Portland, Oregon. I am the 2014 Oregon State Teacher of the Year and have been honored to be named an NEA Global Fellow twice. This year I will be traveling to both South Africa and Bangladesh to work with teachers and students. I also create Ability Guidebooks. These are step-by-step picture books to help people with autism get out into the community. There are 140 Guidebooks for 36 countries in six languages! 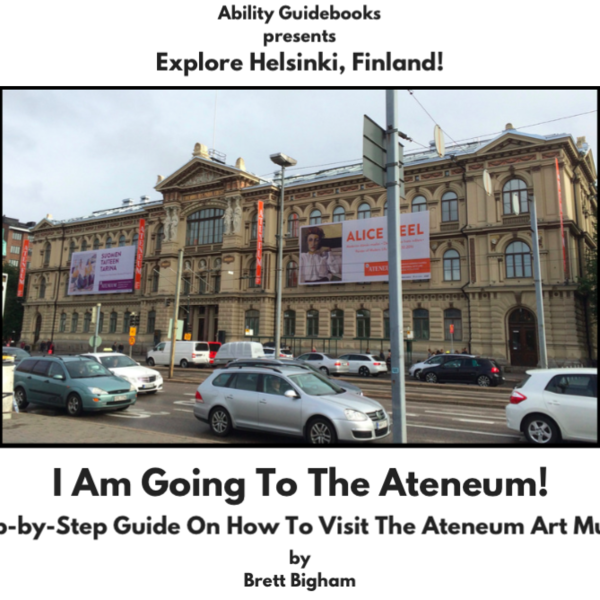 I was very lucky to visit Finland and create several books for Helsinki. I hope I can find a teacher or classroom that would like to translate some of the books! I look forward to all the amazing educators I will be meeting as a HundrED Ambassador! I create Ability Guidebooks. These are step-by-step guides that teach people with autism how to visit places in the community. The first Ability Guidebook I wrote, "I Am Going To Ride The Portland Tram UP! ", was designed to help my own students deal with their anxiety about riding the Portland Arial Tram. Since those first books, I have created over 140 books for 36 countries and they are now available in six languages! This year I was honored to be invited to Bangladesh to train and observe some of teachers that work with children with special needs. Only a few schools in Bangladesh accept children who need special instruction and it was incredible to be able to share the best practice I have learned in my years as a teacher. I look forward to acting as mentor teacher to these programs for many years to come! I learned about HundrED Ambassadors when I was searching for Finnish teachers to help translate the Ability Guidebooks for Finland. My hope is that when more people hear about the books they will step forward and create them for their own communities. I'm ready to help them do that! If we know a person in a wheelchair needs a ramp to attend a field trip, we choose a place with a wheelchair ramp. If we have students who cannot hear, we choose a place with closed captions. An Ability Guidebook is that kind of support for people with autism. It is my belief that every school, every field trip and every community destination should have a book like this! Simple supports like these can help every student flourish! Modern technology gives us an amazing opportunity to share our ideas with other teachers and students. Over the past two years, I've given away over 35,000 pieces of curriculum! This has only been possible as the internet has created a platform from which to share our creations for free. We need to harness the power of the internet to create and promote new educational innovations. The Ability Guidebooks successfully achieve this as no printing is required to access them; they exist as free online support. You can read more about my work on my website. I am so honoured to have met Koen Timmers this summer and I am so impressed by what he is doing. Using the internet to bring teachers to children who have no access to education is a brilliant project. I am proud to say that he has inspired me to do online teaching to teachers in Bangladesh. Next month I will be travelling to Bangladesh to train teachers to understand and best equip students with special needs. I intend to follow Koen's lead and continue to have monthly lessons and help sessions with these teachers to help them become the best special education teachers they can be! As a special education teacher, I know how important the environment is to some children with autism. I adapt my room to their needs. I'm fascinated by a school that has adapted their environment so well and I wish I could see it for myself! I love this program! I often use animals to teach routines to special needs students. For instance, a fish is a great way to teach daily, weekly and monthly schedules. You feed the fish every day, you change part of the water every week and you vacuum and do a full water change every month. Many people with special needs live in foster care. If they are able to keep a pet fish in their room and take care of it, then they have a companion. I use plants in the same way. If caring for an animal is too hard, then we try nurturing a plant through weekly watering. I love this innovation because it teaches children the skills needed to keep their own pet and owning a pet means always having a friend!